How Do I Release Lockouts? While being locked out of your site can be frustrating, it means that iThemes Security is doing its job. Security doesn't discriminate, if it notices a possible threat it will defend against it, even if it's your own site. If you do find yourself looked out we have two options to get you back in. 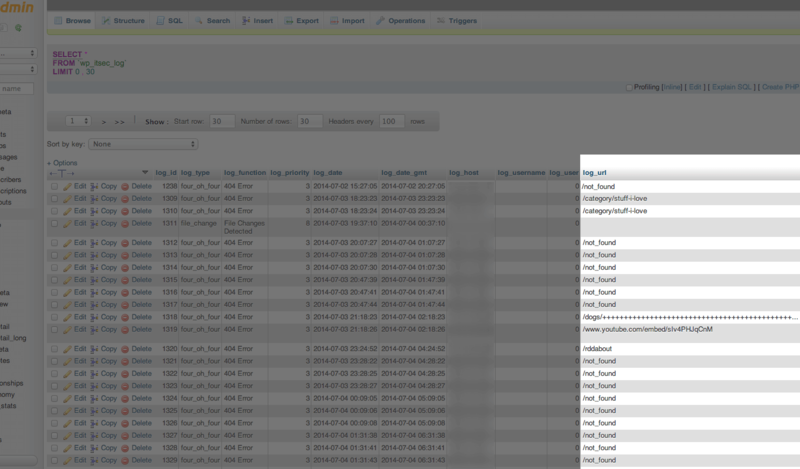 There's a manual method of clearing it, and an automated method by using iThemes Sync, our WordPress management plugin. If you'd like to use iThemes Sync the first 10 sites are free, so you're not out any cash. A common support request we receive for iThemes Security involves getting locked out after installing iThemes Security (formerly Better WP Security). Lockouts usually result from too many 404 errors being hit (the 404 Detection setting). 1. Log in to your hosting cPanel and open phpMyAdmin to open your site’s database. 2. Locate the correct database for the site where the lockout occurred. Find the table xxxxxx_itsec_lockouts (where xxxxxx is your table prefix). 3. In this table, look for your IP address. If your IP is included in the table, delete the record with your IP address. Not sure about your IP address? 4. After deleting the record, check to see if you have access to your site again. In some cases, you may be receiving so many 404 errors that you may immediately be locked out again. If this is the case, check again for your IP address in the table and move on to step 5. 5. Find out what is causing the 404 errors and fix each error. Open your iThemes Security Logs, find the entries with your IP address. Each line represents a file that your site is pointing that does not actually exist (hence the 404 error). You will need to manually fix these errors 1 by 1 to prevent lockouts from reoccurring. Once you fix the errors, you should no longer have any problems accessing your site. You’ll also have the added benefit of fixing them for Google and other search engines which may penalize you for too many 404 errors. 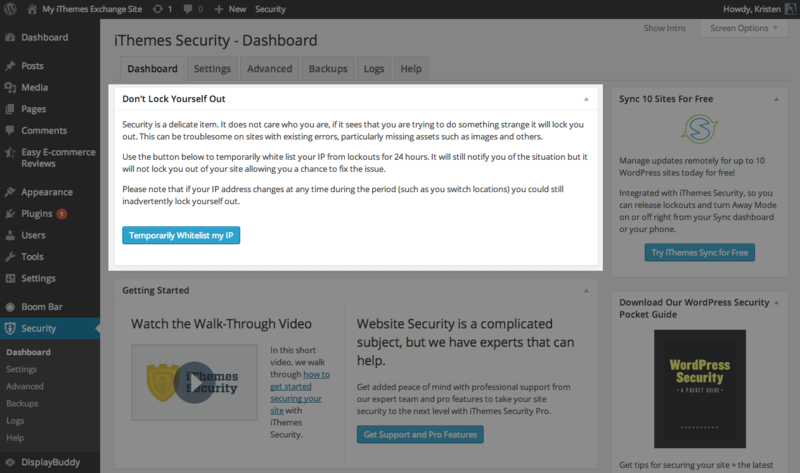 iThemes Sync is our WordPress site management dashboard that integrates with iThemes Security. With Sync, you can release your iThemes Security lockouts remotely. Once you’ve installed and activated Sync on your WordPress site, you’ll be able to release 404 lockouts after logging in to the Sync dashboard. From the individual site view, you’ll be able to see the IP addresses for any locked out users. To release this lockout, just click the Release button. The latest version of iThemes security includes the ability to temporarily whitelist your own IP. 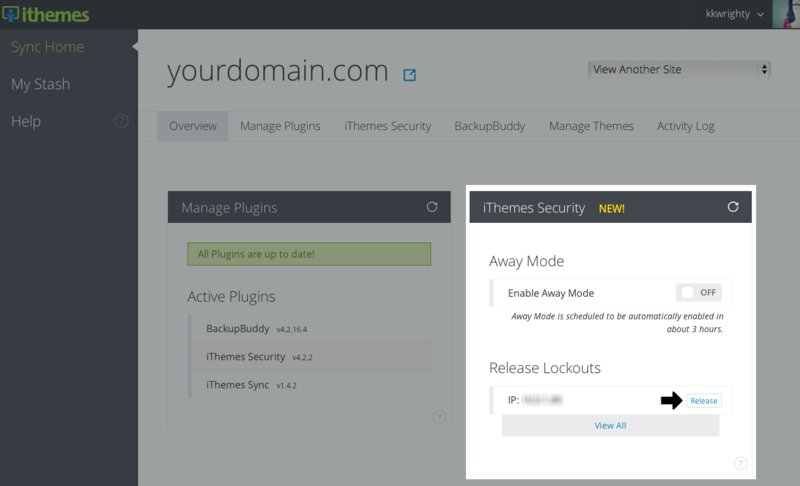 From the iThemes Security Dashboard, use the button to temporarily whitelist your IP from lockouts for 24 hours. It will still notify you of the situation, but it will not lock you out of your site allowing you a chance to fix the issue. Please note that if your IP address changes at any time during the period (such as you switch locations) you could still inadvertently lock yourself out. What Do I Do if I'm Getting Lockout Notifications with My Username? How to Update PHP on your site or server. Where can I get support if something goes wrong?